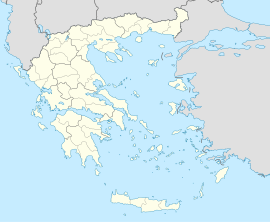 Aridaía (Greek: Αριδαία; Bulgarian and Macedonian: Съботско/С'ботско S'botsko) is a town and a former municipality in the Pella regional unit, Greece. Since the 2011 local government reform it is part of the municipality Almopia, of which it is a municipal unit. It was the capital of the former Almopia eparchy. It is located in the northwest corner of the Pella regional unit, bordering the southern part of the Republic of North Macedonia and the northeast corner of the Florina regional unit. Its land area is 562.910 km2 (217.341 sq mi). The population of Aridaia proper is 7,057, while that of the entire municipal unit is 20,313 (2011 census). Its largest other towns are Prómachoi (pop. 1,740), Sosándra (1,078), Ápsalos (1,121), Loutráki (1,146), Polykárpi (1,049), Tsákoi (961), Voreinó (766), and Χifianí (767). The municipal unit is divided into 17 communities. Wikivoyage has a travel guide for Aridaia.